Poke burrito with spicy ahi at Pokéworks in Somerville’s Davis Square. Pokéworks, which started in New York City and is growing rapidly, with locations across the country, is now bringing Hawaiian raw-fish salad to Somerville. At dinnertime, the line can snake out of the small, brightly lit restaurant with its cheery neon sign and fresh white tile walls. Poke (pronounced poh-keh) is the latest craze in the world of customizable fast-casual. If you’ve eaten at a Bon Me, or a Chipotle, you know the drill: Pick your protein and build up your bowl or burrito with fixings. 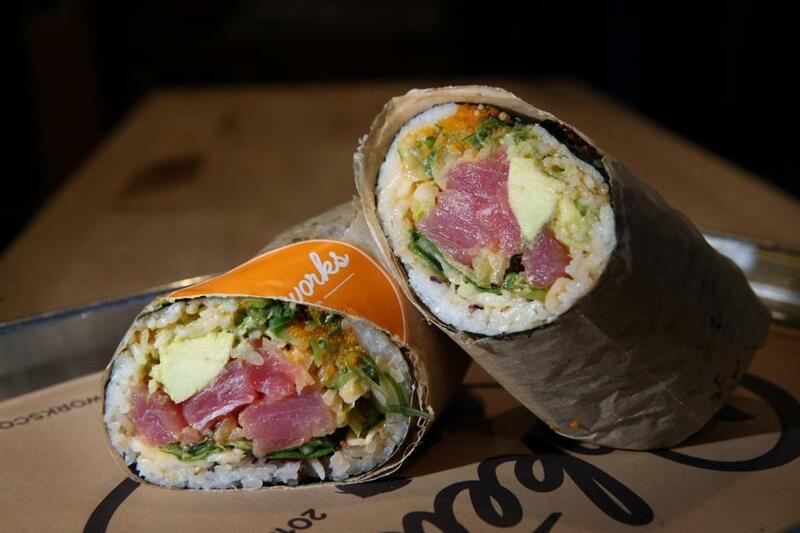 And yes, you can get a “burrito” at Pokéworks, one filled with some combination of raw salmon, tuna, scallops, and shrimp. A machine emblazoned with the Pokéworks logo presses sushi rice (or brown rice, or quinoa) onto a seaweed wrapper. Then the giant sushi roll makes its way down the assembly line, where employees add toppings such as edamame, seaweed, and crab salad before rolling it up in parchment. An informal poll shows people generally find this concept either delightful or disgusting. We’re mostly curious, so we start with a wasabi shrimp and scallop sushi burrito ($10.95) from the “Signature Works” side of the menu — pre-picked combinations that you have rolled up or spooned over rice, quinoa, or salad greens. The big mouthfuls of unseasoned wet scallops and tiny raw shrimp aren’t appetizing. The roll is augmented with scallions and sweet onion, masago (roe), edamame, and wasabi aioli, but it lacks flavor. The shiso salmon with ponzu sauce ($10.95) benefits from adding extra toppings like avocado and spicy furikake for more interest. A spicy ahi roll has a bit of kick ($10.95), with more onion, sesame, cucumber, roe, and spicy aioli, but we prefer our poke served in smaller bites and more highly seasoned. This is a critical challenge for the make-your-own operation. In Hawaii, poke is traditionally a salad assembled ahead of time, so the flavors have a chance to permeate the poke, tenderizing and flavoring, like a ceviche without the acid. Perhaps Pokéworks would consider premixing its fish with the signature seasonings, but still allow customers to pick the toppings and mix-ins? This former Oahu resident can dream. Our favorite poke on offer, and the closest approximation to what we’ve eaten in Hawaii, is the umami classic, ahi tuna with onion, hijiki seaweed, cucumber, sesame seeds, and soy sauce ($10.95). We might even add extra fish ($3) and have it over greens, which appears to be a favorite of the post-workout crowd, who queue up giddily in their athleisure wear behind Tufts students and young professionals. Everyone seems to be having a great time choosing among toppings like fried onion, seaweed salad, and togarashi sprinkle. If you don’t eat fish — well, really, this is not the place for you. But they do have sweet chile tofu poke ($10.95), which one dining companion dubs “solidly mediocre.” The menu says there is a sweet ginger chicken option, but it isn’t available the day we try to order it. The restaurant, which opened just a month ago, might deserve a pass for some of its missteps, like untrained staff who don’t seem to have a firm grasp on the menu. Other issues, like muddy, browning greens, are less forgivable. We might come back in another month to see if they’ve worked out the kinks. The staff is friendly, and the food is affordable, on trend, and (except for those greens) fresh. Pokéworks might not please poke purists or Hawaiian expats, but if you’ve ever dreamed of making a sushi sundae, this is your spot. 261 Elm St., Davis Square, Somerville, 617-996-1198, www.pokeworks.comAll major credit cards accepted. Wheelchair accessible. Hours Daily 11:30 a.m.–10 p.m.